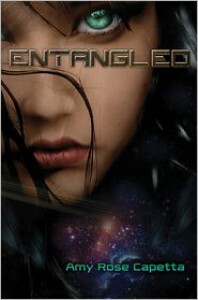 Entangled was a fast-paced and enjoyable sci-fi read. I was initially drawn in by comparisons to Firefly (which I'll admit that I have yet to complete), so when I saw it was up on Netgalley, I just had to request it. I was a bit unsure about whether or not I would enjoy Entangled based on the first chapter - rather than establish a background for the story, readers are just thrown into Cade's life, space-slang and all. While this didn't lead to info-dumping on the author's part, it was rather confusing... though it did keep me wanting answers and formulating my own opinions on how Cade and Xan's link worked. I really enjoyed seeing the world through Cade's eyes. I'm not musically inclined by any means, so it was really neat getting to see how all of the musical undertones shaped her experiences. This was also reflected in the writing, which had a distinct lyrical quality to it. Cade was a strong, determined lead who underwent tremendous character development: going from the isolated, tough girl to someone who can depend on friends - and even enjoy their company. My only issue with Entangled was that the concept of quantum entanglement wasn't explained in quite as much depth as I was hoping for. Cade's relationship with Xan felt, to me, more like a sibling/familial relationship than a romantic one, so I found that the progression from strangers to partners occurred far too quickly. Overall, I enjoyed reading Entangled, and I cannot wait to see what this author writes next.